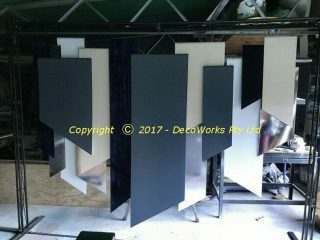 A very different idea for a recent function was the building of this asymmetrical panel backdrop. 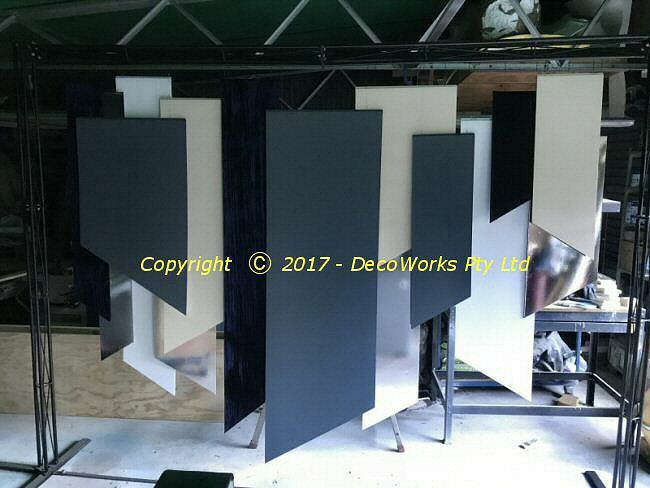 It was made up of differently sized panels, cut at an angle at the bottom, with different finishes on the panels. 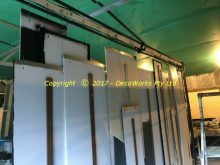 Some panels were painted cream or charcoal blue while others were covered in crushed navy velvet or mirrored mylar film. 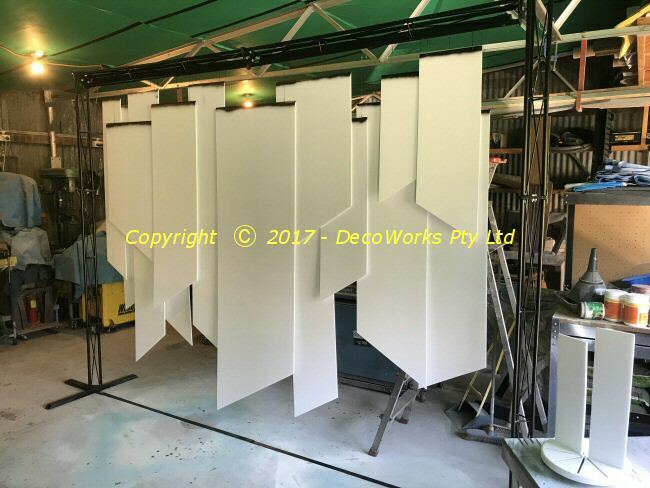 The panels were hung from a steel support structure which was 2.4m high by 3m wide. The frame was built so it could be dismantled into 1.5m sections for ease of transport. On the back of the top support a timber baton was fixed that had eye screws at predetermined positions so the panels hung in their correct configuration. 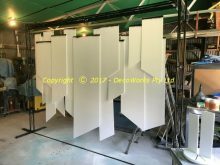 The panels were made from 5mm foamcore board with a 1mm aluminium strip glued along the top edge that had holes to attach the wires which supported them. When the velvet was glued to the panels they developed a slight bow which made them hang unevenly. This was fixed by attaching 45x5mm hardwood braces on the backs of the affected panels to keep them hanging flat. The same happened when the panels were painted. This entry was posted in Projects and tagged display, marketing, props. Bookmark the permalink.